One of the most important qualities of anarchism is that it is a universal philosophy that transcends cultural and geographical divisions. While it has traditionally been strongest in Western societies, there are encouraging signs that it is also finding a resonance elsewhere. There has been a recent resurgence of anarchism in Egypt and across the Arab world, for instance. And there is now excellent news of an inspiring five-day anarchist event in the Philippines, which sounds as if it could be the start of something really big. 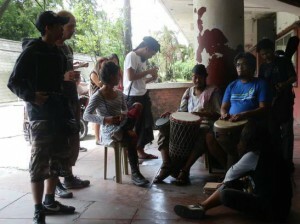 The Anarkiya Fiesta 2013 was held at the Polytechnic University of the Philippines (PUP) in Sta. Mesa, Manila from July 22 to 26. It was co-organized by various groups, including the university’s Institute of Social Sciences and Development, the Mobile Anarchist School, the Local Autonomous Network (LAN) and Tau Gamma Phi and formed part of the Mobile Anarchist School’s programme which started in 2011. Focusing on the University of the Philippines’ Merriam College and communities in Taguig, Muntinlupa, Makati, Pasig and Bulacan (Sapang-Palay and Baliwag), this has been designed to popularize anarchist alternatives, ideas and experiences. The final day, which was the biggest event, featured a speech by the director of the Polytechnic University of the Philippines Institute of Social Sciences and Development, Hilda Felipe San Gabriel, who welcomed the possibility of having follow-up activities/project in the near future. An anarchist professor from Marinduque State University, Randy Nobleza presented a very concise definition of the topic with relevant examples and analogy. There was a discussion of anarcha-feminism led by LAN volunteer Melissa Gibson, a presentation on Christian-anarchism by a teacher, Asher Quimson, and a discussion of the close relationship between technology and anarchist resistance by Jong Pairez. Environmental aspects of the anarchist analysis were offered by Bas Umal, who spoke about permaculture, solar power and flood awareness. He also mentioned different tactics to encourage people’s participation. There was even a cultural programme organised by LAN volunteers, with various traditional and ethnic percussion, string and wind instruments and the performance of a closing ritual through fire dancing. A pair of fire dancers (male and female) showed their dancing skills for about 15 minutes combined with short chanting and speeches. The website adds: “Informal discussions took place spontaneously; students approached autonomous activists to inquire about anarchism. Anarchists in the UK could do a lot worse than emulate the efforts of our comrades in the Philippines! Anarchist Festival 2014 anyone? * As Winter Oak Press report on their blog, The Anarchist Revelation is now available in London from both Housmans and Freedom bookshops.